Bersted is a civil parish in the Arun district of West Sussex, England. It is made up of two somewhat independent villages, North Bersted and Shripney which contribute to some common amenities. An electoral ward in the same name exists. This ward contains a little of Bognor Regis but still has a total population taken at the 2011 census of 8,496. Elevations range from 8m in the south-west to 2-3m above ordnance datum in the south-east where a straightened river drains the parish. 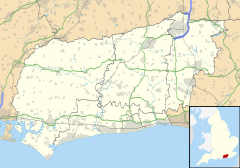 An industrial and business estate takes up the easternmost part of Bersted - in common with most of the country business tends to refer to their post town Bognor Regis and includes a superstore. Some of this area is in the town's boundaries. The ancient village of South Bersted is now part of Bognor Regis civil parish, it has the 13th century church of the Bersted ecclesiastical parish, which is mid-ranked in the national system. This is part of the built-up area next to Bognor Regis accessed on the A259 road commencing 1 mile (1.6 km) northwest of the town's seafront centre. Shripney, in the northeast, has evolved from a thirteenth-century hamlet. It lies on the A29 road 2 miles (3.2 km) north of Bognor Regis. It has the Robin Hood pub on the Shripney Road. In Shripney Lane, there are over forty dwellings, including thatched cottages and caravans. The most recent change to Shripney Lane was when modern houses were built in 2004. ^ "Key Figures for 2011 Census: Key Statistics - Area: Bersted (Ward)". Neighbourhood Statistics. Office for National Statistics. Retrieved 14 October 2016. ^ Historic England. "Details from listed building database (1190914)". National Heritage List for England. Retrieved 5 May 2014.